Greetings again from the darkness. From the department of ‘The more things change, the more they stay the same’ (a phrase attributed to French writer Jean-Baptiste Alphonse Karr), there is a segment in this documentary showing Nixon’s Vice President Spiro Agnew comments on the “evil liberal media”. The only thing missing is the now all-too-familiar catchphrase “fake news”. If, as many believe, we are in a re-run of a political cycle from that era, we should be so fortunate to have the writers and journalists of that era … specifically Jimmy Breslin and Pete Hamill. Co-directors Jonathan Alter (political journalist and author), John Block, and Steve McCarthy are behind this HBO documentary that flashes back to a time when reading the morning newspaper was a ritual for much of the world. This was before the internet and certainly before Tweeters began presenting opinions as breaking news. At one point, the city of New York supported 7 different newspapers, and these two writers – very different in style – are forever linked to the city, to their ‘street poetry’ and to each other. Jimmy Breslin and Pete Hamill were at various times co-workers and rivals, yet always friends … a friendship based on mutual professional respect. Pete was the more likable one, while Jimmy was the brash New Yorker – a celebrity who admittedly had enemies. The filmmakers provide a background on each, often with the writers themselves providing color commentary. Specific events from certain years are used a story structure: 1984 and Bernhard Goetz, 1989 shows our current President (30 years younger) dishing racial divisiveness via an emotional reaction, the 1963 JFK assassination and how Breslin chose to interview the man digging the grave, Vietnam in 1966, 1976 when both were employed by The New York Daily News, the letter Breslin received from Son of Sam in 1977, the same year Hamill was editor of two newspapers simultaneously, the 1985 AIDS outbreak, and the 1991 Crown Heights riots. We learn Breslin often held court at a local bar, and that Hamill dated Jackie Onassis. Breslin’s baseball book “Can’t Anybody Play this Game?” is discussed, as is what Hamill calls “the rhythm of writing”. A 2015 interview with the two elderly men makes the bond quite obvious, and an emotional segment shows Pete and his wife recalling that tragic day on 9/11. The talking head interviews featured are many and impressive, including: the siblings, offspring and spouses of the two men; writers Tom Wolfe, Gay Talese, and Nicholas Pileggi (“Goodfellas”); performers Tony Bennett, Robert Deniro, and Shirley Maclaine (also a love interest); activist Gloria Steinem; cartoonist Gary Trudeau; and other historians, journalists, and writers. Anne Marie is mentioned as the woman who sat between the two writers at the Daily News, and we can’t help but think she deserves her own movie, given her connections (so to speak). 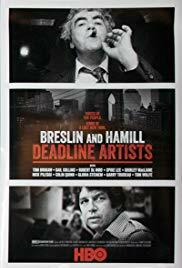 Breslin and Hamill derived energy and were driven by passion for their causes and observations … and their agenda was drawn from the need to get the truth told, not just the glory of a headline. The message is that local journalism is important, while today, we are allowing it fade away. Breslin is shown hunting and pecking until the end (in 2017), and it’s likely Pete will as well.